Week two of operation “cheap figs” has run pretty smoothly with the second set of five “gangers” now also complete. The only slight blip came when Myles wandered in on Wednesday and asked “What exactly are you doing these for?” after a few seconds thought I answered “To see if I can! Don’t you have some “Uni” work you should be doing”? With this flea in his ear he left. Anyway I’ll go through the figures individually again as I did last week…. The first figure didn’t have an awful lot done to him to be honest; I quite liked the “mutton chops” style of his beard and his pony tail hairstyle. So I let them alone along with his checker pattern armoured vest, just adding T-shirt sleeves and straps to cover his arm joins and hold on his backpack respectively. Other than this and carving off his elbow pad he’s just as he came out of the box, easy! 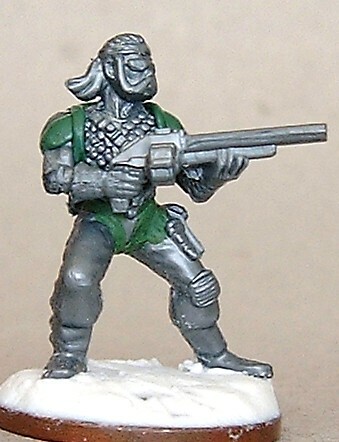 The other shotgun toting chap reminds me of the film “Steel Dawn” with Patrick Swayze from the eighties, again not a great deal needed to be done to him, I gave him one of the Radio backpacks from the troopers box, another cross belt (to complement the one already moulded on),shoulder pads (probably going to paint these as metal), and the obligatory long haircut (to me this looks like a cross between Luke Skywalker and Conan the Barbarian). He seems to have a good hero look to him. I’ve mentioned hairstyles before so when it came to the last of the male figures I decided the best way to cover up the “Robot eye gizmo” (as seen on one of the figures last week), was to sculpt some long hair over it, a bit like the singer from the “Human League” pop band. Before this however I needed to complete his body, so leaving his chest bare and medallion intact I added a long open overcoat (this was supposed to look like the leather one’s favoured by the “Matrix” fraternity, but finished up more like a WW1 greatcoat (Oh well!)). 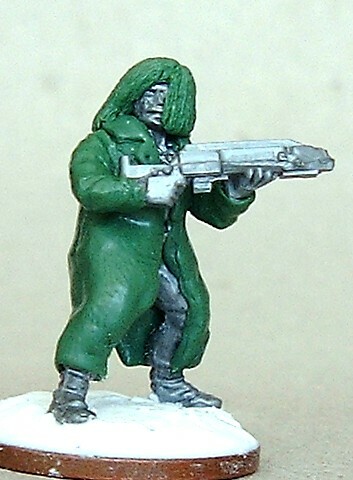 Once his arms were added and sleeves applied, his masses of long hair were sculpted; the final figure has a bit of a “Shadowrun” look to me. On to the ladies, on the first one I decided to do an afro hairstyle for something a little different, and the clothing I had in mind just seemed to go well with that style too. Looking at her legs they were a little odd (as mentioned last week) they seem to curve way back at the calves, she seemed to have a knee pad or wrinkled bottom to one knee length “pant leg” and her boots don’t match each other. I decided the easiest way to sort this out was to add a pair of roll top boots (an old favourite of mine you’ll have noticed by now!). Then leaving the rest of her lower half alone I started to carve away her hair ready for her new hair but disaster, I snapped her head off! After gluing it back on (twice!) I decided to give her a fluffy jumper with thick collar to strengthen the join (this wasn’t enough though I discovered after knocking it off and losing it once more, so drilled and pinned it as well in the end). 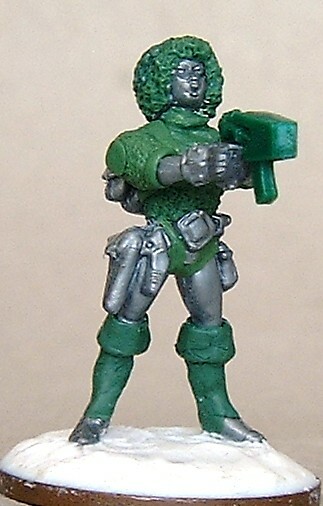 Once her arms were on and elbow length sleeves added I changed her gun and added a strap for her pack. The end result for some reason keeps reminding me of an old Sci-fi movie I saw as a child called “Moon Zero Two” though I can’t for the life of me think why! So that’s it all the gangers are finished just need to paint them now, I’ll probably do them in two lots of five (starting with last weeks five). 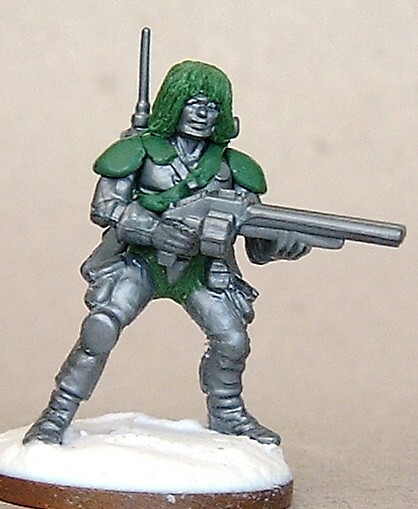 I don’t plan on doing as much re-working on the troopers, I saw “The Winter Soldier” last week and I’m twitching on making the troopers in to “SHIELD” or “JAVELIN” (see Superheroes part 4) proxies. We’ll see how I feel at the time. 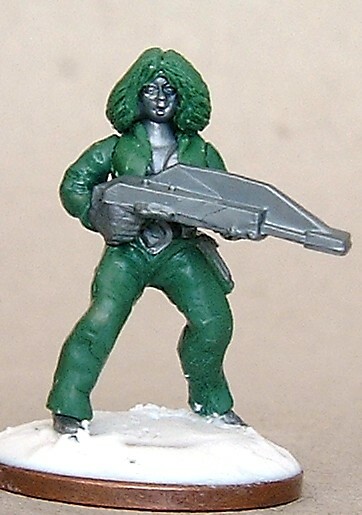 This entry was posted in 28mm sci-fi, sci-fi and tagged 28mm sci-fi sci-fi. Bookmark the permalink. Looking forward to seeing them painted. Thanks again Blaxkleric, I haven’t been to Salute for many years now, last time we were trading there was the year there was all that controversy about the WW2 German re-enactors in the middle of the hall, I’ve got my eye on some more EM-4 miniatures at the moment but I’ve also got it on some completely different fig’s from elsewhere as well so I’ll have to see how the mood takes me at the time. Have been keeping an eye on your blog, nice work on the 6mm moderns by the way, how are you getting on with your Ben Grimm (thought Ben Grimm fitted into that sentence better that “Thing”).